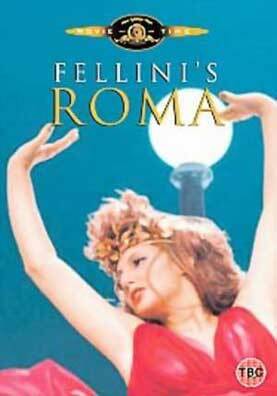 Fellini’s love affair with the Italian capital is legendary but in Roma, there’s a hint of regret. The city is presented as an old whore, plundered over millennia by a succession of conquerors, the most recent of which being the hippies, draped over her monuments in a dope haze. Prostitutes prowl amongst the ruins and construction workers tunnel deep into her foundations, only to break into a womb full of pre-Christian frescos that evaporate like spirit figures upon contact with the outside air. This is a strange and wonderful work that weaves together several strands including a contemporary, documentary-like story featuring Fellini himself as the director of a camera crew busily shooting everything the city has on offer, from a bus load of snap happy American tourists to an accident on the freeway that has left a trail of cattle corpses. There are flashbacks too, to when the maestro was a young man, soaking up the pleasures of wartime Rome with its brothels full of gaudy tarts and piazzas crammed with vocal locals, chowing down on their spaghetti and snails. Even further back, when Italy was in the grip of the fascists, we meet Federico the school boy, being indoctrinated into the icons of his Fatherland including Caesar and Stalin. And while the three time lines never combine into a conventional narrative, the film works it’s magic as a surreal memoir. Like the character of the Princess, who hosts an Ecclesiastical fashion show featuring outlandish habits and vestments flashing with disco lights, Fellini bemoans the passing of a Rome he once knew and loved. He tries to recapture it at a café but is interrupted by Gore Vidal who tell him that it is simply “a city of illusions”, the perfect place to be for the end of the world. He attempts to buttonhole the famous actress Ana Magnani but is told to go home, she doesn’t trust him. In the end, all that’s left are the motor bike riders, roaring around the streets at night, watched over by the massive walls of the Colosseum – just another generation of transient humanity.